All is new and just manufactured by us! The Composition of This Tree Model. 1pcs Main Tree Trunk with 2 Parts and Base. 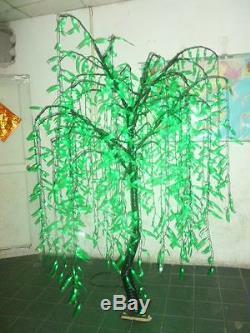 9pcs Branches and Each Branch has 5pcs Sub-branches. 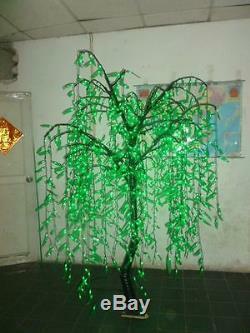 Each Branch has 112pcs LED Bulbs. 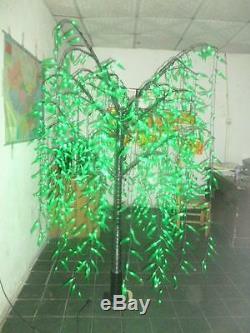 Accessory Package: 1pcs Wrench for LED Tree Installation, 1pcs Insulation Tape, 1pcs User Manual and Some Additional Willow Weeping Tree Petals with Green Color. 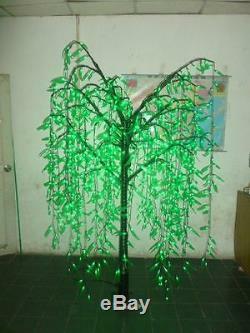 LED Artificial Willow Weeping Tree. 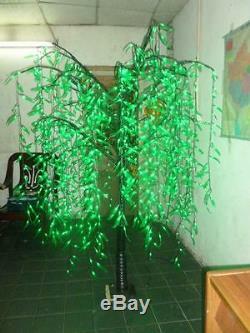 1,008pcs LED Green Bulbs on the Tree Totally. Outdoor Use for Party, Holiday, Home and other Places Decoration. Direct alternative to the ordinary energy-saving lamps, does not require any conversion. No UV and IR radiation; does not contain lead, mercury and other pollution elements. 110V or 220VAC is optional. Suitable for outdoor use for Christmas and Decoration. LED Quantity: 1008pcs LED Bulbs Totally. Plug: European or US Standard. Place of Origin: Hebei China(Mainland). The item "LED Willow Tree Outdoor Christmas Tree Light LED Lamp 1,008 LED Bulbs Green 6ft" is in sale since Saturday, September 9, 2017.